Set amongst rolling hills, river valleys and abundant greenery, Aurora Woods is home to both the natural wonders of the Oak Ridges Moraine and all the urban advantages that come with living in the center of York Region. This weekend, you’ll be able to preview what the new community entails. Saturday, March 2nd marks the Grand Opening Weekend for Treasure Hill Homes‘ newest project, Aurora Woods on Bayview. With the presentation centre open, the public will have the opportunity to find out more about the magnificent collection of single homes. 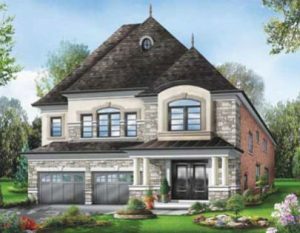 Situated on Bayview Avenue, just north of Vandorf Side Road, Aurora Woods presents stunning detached homes nestled in nature and beautiful landscapes. These exquisite elevations inspired by Chateau, French Provincial, and Tudor-inspired architecture include 36, 40 and 45-foot singles ranging from 2,400 to 4,500 feet. The surrounding community boasts over 46 parks covering more than 700 acres of mixed forests, meadows and wetlands. Directly beside Aurora Woods, the Vandorf Woodloot provides easy access to the scenic Holland River Valley Trail, the Oak Ridges Trail and the Nokiidaa Trailwinds. There are a wealth of recreation opportunities close by with the Aurora Family Leisure Complex, the Aurora Community Arboretum, Sheppard’s Bush and Lambert Willson Park. But that’s not all. The area is also home to several lush golf courses, four large skating rinks, over thirty playgrounds, as well as countless shops, restaurants and entertainment options. Aurora Woods proximity to Highway 404, GO Transit and Viva/York Region ensures the big city – or wherever your commute takes you – is never a long way off. For more information or to arrange an exclusive preview appointment pre-register at treasurehill.com.